It is hard to believe that we've been writing for 31 days. We made it! Today is the final day for the Slice of Life March Challenge. I've been amazed that so many people have participated. I've enjoyed stopping by blog after blog and reading the small stories in people's lives. I've realized that the small stories are really the big stories. Life is full of small moments that are quite significant. The threads of this challenge weave together to form a quilt of story. Life is full of endings, but it seems endings are quite often new beginnings. As I sat in church this morning listening to the Easter story I was once again reminded of how endings are often new beginnings. Jesus died on the cross and most thought that was the end of the story, but then on third day when he rose from the dead there was a new beginning. When students graduate from high school they move on to new beginnings as they follow the paths that will shape their lives in the future. 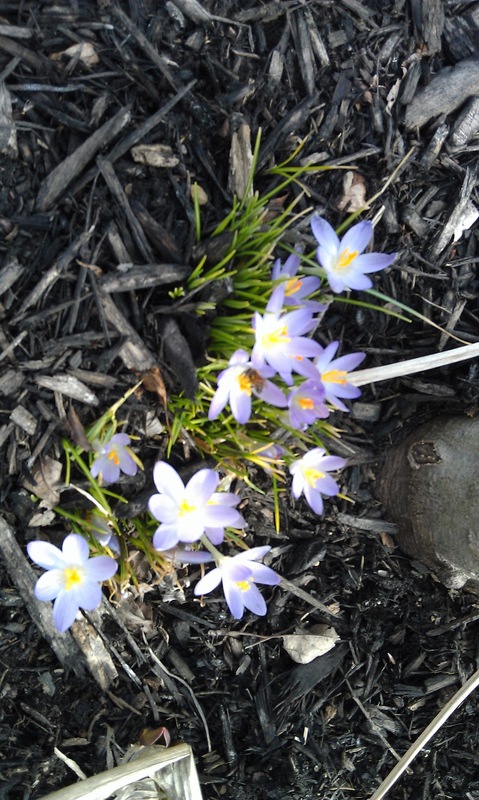 Leaving an old house and moving into a new one, the change from winter to spring, leaving one job to move to another are all examples of the way life's endings are really new beginnings. 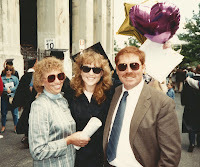 Last May, my oldest daughter Cortney graduated from Baldwin-Wallace College. We were quite proud of her. At the time, the president of the college, Richard Durst, was retiring. He talked about how much his work at the college had meant to him and then shared his plans for the days that followed - his ending and new beginning. 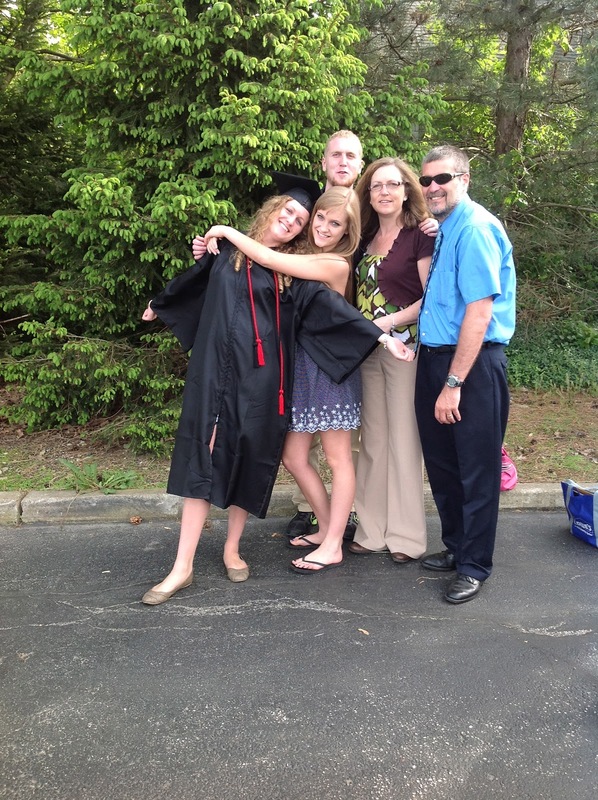 Cortney also was ending her time at a college that had been a perfect fit for her. In the weeks that followed she searched for a job. It wasn't long until one was offered in another state. She's now teaching 8th graders in North Carolina - an ending and then a new beginning. Today as I end this challenge, I'm relieved to have been able to post each of the 31 days. There are posts I'm satisfied with at the end of the challenge, and some I wish I wouldn't have had to push the publish button after writing. What matters is that I - along with at least 150 other bloggers - managed to write every day. 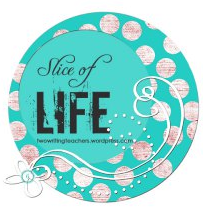 As we end the Slice of Life March Challenge, we begin the weekly Slice of Life writing hosted at Two Writing Teachers. My goal is to keep up with the weekly challenge this year (and I'm counting on friends like Michelle [Literacy Learning Zone], who maintain the weekly goal, to keep me going). For the month of April I plan to join Mary Lee, A Year of Reading, in posting a poem each day during National Poetry Month. Yes, today's the end of Slice of Life, but it is full of new beginnings. Many of you asked about the songs on my iPod. It is an eclectic collection spanning many of the musical phases of my life....and the music my kids have sent my way. I like to listen to a wide range of music. Today I traveled home from South Carolina. I'm not the best at sitting still so driving these long distances can be a bit of a challenge. My iPod kept me singing for miles and miles. The musical Rent kicked off the trip. When I entered the country music highway I switched to genre: country. Garth, the Dixie Chicks, SheDaisy, Toby Keith and Kenny Chesney were among the most played. Of course, you have to sing to a little Loretta as you travel through Kentucky. Then I switched to my "Yeah, Baby" playlist. Just sing a little pop and top 40 and you have it. The group Fun and singer, Adele, brought me home. Before I knew it, I was home. Today is Poetry Friday. Mary Lee is hosting at A Year of Reading. Stop by to enjoy the poems. Two days until National Poetry Month begins!!! Today is my mom's birthday. I'm lucky to have one of those amazing moms who is always there when you need her. I should be writing a sweet sappy poem for her birthday, but instead I'm listening to her and my daughter play a game of hand and foot. So I decided to write this fun "rhyme-y" poem instead. Happy birthday, Mom. when you walk in the door. when your feet hit her floor. is a really big sin. and will dance if she wins. when you walk through her door. Recently I read this post, A Pocketful of Questions, at Box of Chocolate's blog (isn't that a great name!) written in a question format. I thought it was interesting so I added it to my mentor text board on Pinterest. I decided today to give it a try. Thanks, Stephanie. As I travel I often ask myself, why do I live in a place where the land is flat? Why do I only see sky when I look across our horizon? Why do I spend my summers looking at corn and beans lined neatly in the fields? Why do I wake to the sounds of coyote roaming the night? Why do I spend June evenings looking from our patio out into the prairie-like land watching for the hummingbird and hoping for a heron? Why do I sit by our french doors with a warm cup of coffee and stare endlessly at the white snow blanketing the grass long since asleep during the endless months of winter? What would it be like to live somewhere else? If you live in the mountains, do you notice the beauty that surrounds you? Do you wake up in the morning, look out your window, and pause at their majesty? Do you note the way mountains seem like a ladder to the heavens? Do you see the way the clouds rest on the peaks bringing earth and sky together? Do you study the way the mountains change from snow covered to nature's dress of forest green? Do you get used to climbing all the time? Do you learn to not worry about driving so close to the edge of a cliff? If you live near the ocean, do you walk out to the beach just to feel the warmth on your toes? Do you walk along the waters edge and savor the feeling of waves splashing on your feet? Do you wander the beach looking for the perfect shell? Do you listen to the quiet roar of the ocean as it moves toward the shore? Do you wake in the early morning darkness to see the sun rise over the ocean? Do you notice the way it rests on the water for a moment before finding its place in the sky? If you live by the river, do you hear its gentle murmur as it slides through your backyard? Do you sit by your window and watch the birds soar over the waters looking for dinner? Do you observe the ice blocks form and rejoice as they begin to melt as warmer days become more constant? Do you note the animals who make the river their home? Do you sit to watch boats move down the river as they carry their cargo to its destination? If you live in the city, do you enjoy the energy the city brings? Do you look up in the darkness of night at the tall buildings, dazzled by the lights coming from inside? Do you enjoy watching people walk up and down the streets in their high heel shoes, fancy clothing, and dark suits? Do you find a place to sit just to take in the conversations? Do you take time to eat at the restaurants, watch the musicals, and attend gallery hops? Do you pause to look at the architecture of the buildings that have stood amongst the pavement covered landscape through generations? What would it be like to live somewhere different than where you live today? Do you ever wonder or do you just open your notebook to capture the beauty that surrounds you? 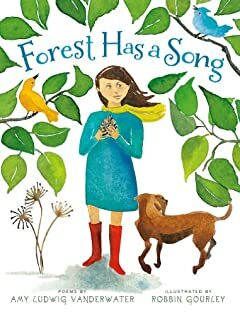 Today I'm sending happy thoughts to Amy Ludwig VanDerwater (@amylvpoemfarm) as her new book, Forest Has a Song: Poems is released! Today is the day it steps out into the world! I have ordered my copy and can't wait for it to arrive. 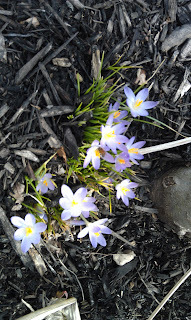 If you haven't visited Amy's blog, The Poem Farm, you'll want to stop by. The first time I came across Amy's blog was when she was writing a poem a day for a year. Yes, for 365 days she wrote poems. At the time I was trying to post a picture each day and couldn't keep up with that. I had no idea how she came up with a poem every day, but she did. I was in awe of her perseverance --- and in awe of her poetry. I've continued to follow Amy's poetry on her blog. At The Poem Farm, Amy not only shares her poetry, but often the thinking behind her poems. She often adds photographs and audio recordings of her poetry as well. As a teacher, I find there are so many resources available on her site. One of my favorite resources is her "find a poem" page. This page allows visitors to search for poems by topic or by poem technique. 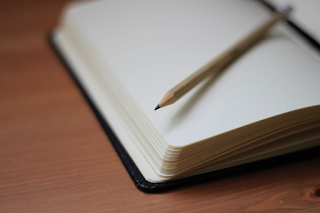 If you are a teacher, a poet, or a writer, you may also want to stop by Sharing Our Notebooks. On this blog, Amy features a variety of people who share their notebooks. It's interesting to see the crafting process of others. As you can see, Amy keeps very busy. I'm so grateful that she is willing to share all of her thinking, collecting, and writing with us. 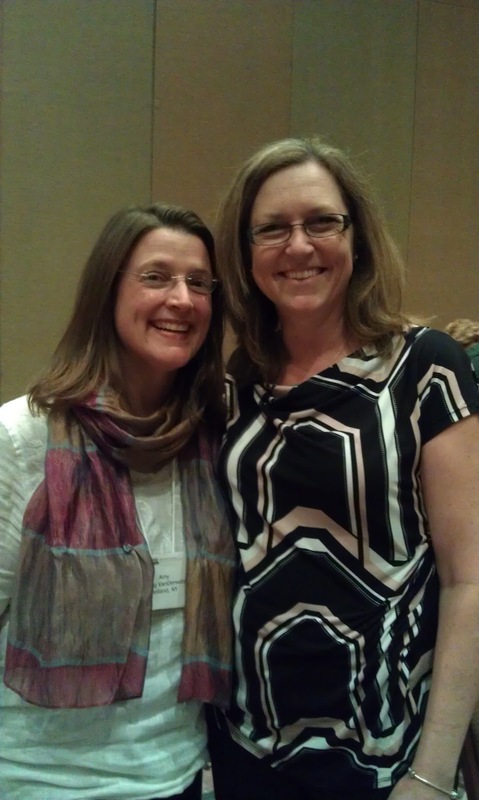 I was so happy to finally have the opportunity to meet her at NCTE in November. Today, I wish her all the best as her new book is released to the world. I'm looking forward to having her poetry resting on the shelf in our classroom. This post is cross posted on my other blog, Reflect and Refine. It's Memory Monday so here's a little story about our trip out west. It's spring break and I'm sitting on my couch looking at a backyard blanketed in snow. At least it's a pretty snow with white fluffy flakes piled in layers on the trees and covering the still brown ground. All of this snow is making me want to take vacation someplace warm. 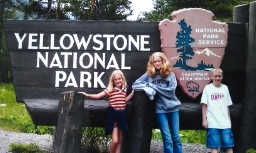 We've been fortunate to take some great vacations with our kids, but the best was the year we traveled out west. It was hot July when we packed our van with our three kids and all we would need for several weeks of travel. The sun sizzled as we put the final items into the van and closed the doors. We were traveling from Ohio to Washington state, then through Oregon, down to California, over to Arizona, and home. To cut down on the cost we planned to rotate between camping and staying in hotels. The kids were excited when we placed them in the van with a cooler of food packed for the journey. We were headed out west to see my aunt, uncle and cousins living in Oregon and Washington. This part of our family had lived out west all of my life, but I'd never been there. I think I was as excited as the kids as we jumped in the van with our maps, snacks, and gear. We drove for days through Indiana, Illinois, Iowa, South Dakota (Badlands, Rapid City, Mount Rushmore), and into Wyoming (Cody). We were getting closer to my family. We stopped, as planned, at Yellowstone National Park where we were camping for two days before heading to my cousin's house in Seattle. It was July, but the air grew chilly as we drove into the mountains of the Yellowstone National Park. 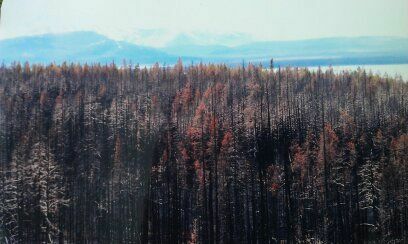 We wove our way around mountains, past sections of trees that had been burned by fire, through herds of buffalo and into Yellowstone. We searched for a place to set up our tent. There were several places to camp so we selected one that was close to the sites we wanted to see and seemed to have places for tents to be set up. I walked up to the ranger managing the site and began to secure a place for our tent for a couple of days. The ranger looked at me and nonchalantly smiled, "You're here at a good time. We haven't seen a bear since Sunday evening." Keep in mind it was only Tuesday morning. "Just keep your food put away and you shouldn't have any problems," she advised. 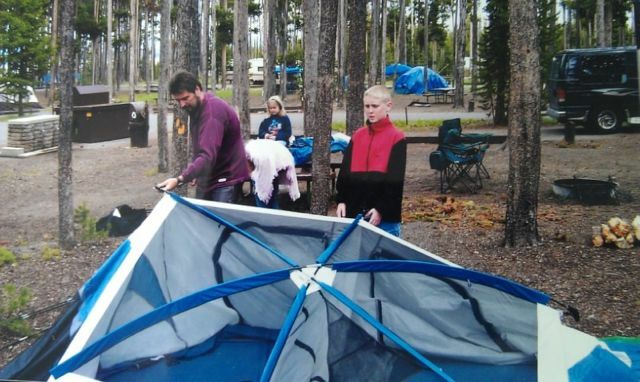 I'm fine with camping as long as I can avoid bugs and wild animals - a little bit of a challenge. I took a deep breath and walked back to the van. Logic told me most people survive camping in the wilderness, and I had three kids in the car that needed my best game face. We drove to our site and set up our tent. I tried not to notice the site behind us with tons of food out on tables. I tried not to notice our proximity to the restrooms and trashcans. After setting up the tent, we got back into the van and went to see the sites. We saw bison, moose, and elk roaming the park. Later that evening, we came back to our site and ate dinner. We set up our sleeping bags and began to call it a night. I listened for the sounds of bear. I don't really know what I was listening for as I have no idea what the sound of bear entering camp to grab the food from the careless campers behind us or the trashcans beside us would sound like. We settled into our sleeping bags as the night grew colder. It was July, but we had come prepared for cooler temperatures. We were all sleeping in warm clothes with our sleeping bags and mats under us. We had added a blanket for warmth, but it was still cold. Soon we were grabbing our coats. We had warmer coats with us, but not our winter coats. It was July and we thought this would be enough, but the temperature continued to drop. We huddled closer together in our tent trying to get warm, but the cold ground below us and the cold air around us began to sink into our bones. Finally we got up and all piled into the van to warm up. We decided to sleep in our van for the rest of the night. The next morning we got up, quickly packed the tent, and were back on the road. 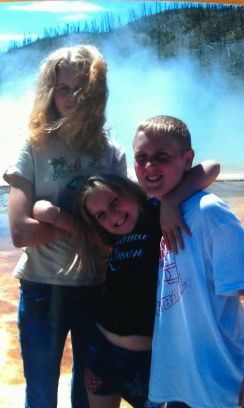 We stopped to see Old Faithful and the other geysers on the way out of the park. We decided one night of freezing cold was enough. Who knew that a bear wouldn't be our biggest concern, but instead the biting cold of Yellowstone in July. Thanks, Carol, for this "me by the numbers idea." It saved me tonight as my other slices "I tried on" (thanks, Christy) weren't working out. Greenday's American Idiot musical was playing last night at the Palace Theater in Columbus. At the last minute we decided to purchase two tickets to see it. We did something we don't normally do, we purchased seats on the floor. We were midway back in the theater which seats about 2,500. It was a new experience to actually be able to see the facial expressions of the actors in the show. The story is about three friends who part ways to pursue their dreams, but life doesn't always turn out as we plan. Each struggles with his own obstacles along the way. The three stories weave together simply and the play seems more about the music than the story. Most songs featured in the performance are from Green Day's American Idiot album. If you like the music of Green Day, you'll enjoy the way the songs are put together to tell a story. Every time I see a musical there seems to be a character who stands out to me. In American Idiot I enjoyed the performance of Trent Saunders who played St. Jimmy. His character seemed to stand for the temptations that can easily pull someone under in this world. Saunders' voice was strong and resonated in the theater. It seemed the cast came to life when he came out on stage. American Idiot will be in Michigan, Indiana, and Illinois in the coming month (schedule of shows). Poetry Friday hosted by Greg Pincus at Gotta Book. If you're on Twitter, you may have noticed Kevin, @dogtrax, share his 25 word stories (#25wordstory). I find these stories fascinating. They provide just enough information to give you a taste of the story, and leave you with much to wonder. I thought I'd give a few a try. I walk into the kitchen in my new white Keds now brown from the creek, I look away. She glances at my shoes --- then laughs. We walk into our new home. The foyer takes my breath away. As I wander from room to room I can't believe we'll live here. Driving onto campus a wave of freedom rises within me. Turning the corner, large buildings surround me. For the first time, I'm on my own. For years she took care of our children while we were at school. She fed them, played with them, and loved them. A true blessing! She sits down behind the wheel; hardly believing it is hers. She starts the engine, turns on the radio, and leaves in her first car. As I hear his name called my heart swells with pride. He walks across the gym floor, shakes the veteran's hand, and accepts the award. Where has the time gone I wonder as she buckles her seatbelt and pulls out of our drive. Her car packed with pieces of home. A similar version is the six word story. These six word stories can be found at this hashtag, #6words. Kevin shared a Mozilla Thimble link which talks more about the origin of the six word memoir. First day of spring break. Snow? Up all night with sick daughter. A cup of coffee fixes everything. I found more links at this Smith Magazine site. says you should be here. When the calendar turns to March some people think of warmer temperatures. Some smile at the thought of spring's arrival. Some ready their kites for the March winds. At our house none of these things are the topic of conversation because at our house the only gust of excitement is March Madness. In March we talk basketball, basketball, basketball. My husband and son have been talking about it for weeks. I knew things had gotten out of control when our oldest daughter, Cortney, called last night for bracket advice. What has happened to our family? Now it's important to know I hardly watch basketball. Yes, I sit in the living room during games and sometimes - only sometimes - I can tell you who is playing. I'm likely to notice all the crazy gear fans are wearing. I'm likely to notice the coach yell at the referee. I'm likely to notice a player trash talking another player, but the actual game I'm usually oblivious to. This evening I headed out into cyberspace to find brackets to prove to my family that my lack of attention to the game could compete against their basketball knowledge. Yeah, I like to talk it up a bit. That's when I stumbled upon this post: The Non-Fan's Guide to the Watching the March Madness 2013 Tournament. I thought I'd offer my own advice for the tournament. 5. Buy good snacks: No matter how bad the games get you'll have good food to eat. Maybe try a few of those Pinterest food pins you've been collecting. You've got the time. 4. Keep your computer charged: With your computer you can sit on the couch with everyone and appear to be watching every game - even throwing in a little commentary now and then - without really having to pay too much attention to it. A quick Google search will find any information you need. It's easy to add a little background information with Google at your fingertips. 3. Cheer on your conference: OK, I admit that when Charles Barkley started to belittle the Buckeyes and the Big Ten I got a little defensive. He went on about how the Big Ten was overrated and likely wouldn't do well in the tournament. Well, that got me a little fired up. It was similar to when someone starts saying mean things about your brother. It's a little personal. So I'm rooting for the Big Ten. Let's show Charles who's in charge. 2. Pick a Favorite Team: I remain loyal to my Buckeyes. I'm a graduate of The Ohio State University so I cheer them on throughout the tournament. Yeah, it's kind of easy to cheer on the Bucks. It doesn't matter who you root for during the tournament. You can root for the underdog, the top dog, your favorite mascot --- and you can change your mind about who you're rooting for whenever you want. 1. 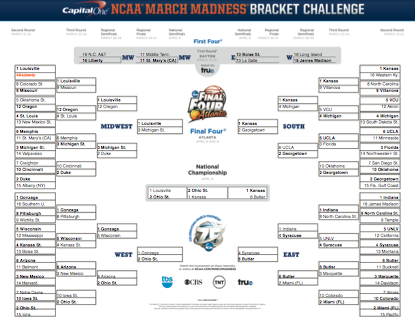 Make a bracket: Yes, challenge all the sport fanatics in your life to a little bracket challenge. Show them that brackets are as much luck as they are skill. Besides, it will give you something to talk about. The Non-Fan Guide suggests making more than one bracket so you can switch them when one starts to lose. I've never tried that, but I think I like the idea! It's day five without internet so I am having to compose my post from my phone. Unfortunately, we live too far from town for real internet. As the Time Warner rep joked, "The hunting must be good where you live." Ouch! We're left to rely on a Verizon Mifi which, though it is the best thing we've had, is slow and inconsistent. We constantly are kicked off, have to wait, or need to reload pages (yes, that uses data). Additionally, with four people using the allotted GBs, we run out often. I was feeling sorry for myself for having to write this post from my phone as I don't have time this evening to run out for internet, but then I remembered DIAL-UP. Oh, dial-up. Remember the beep beep beep as it connected. The torturous wait time to load a page. The enormous amount of time required to download a picture. Since it is "Memory Monday" for me, I thought I'd share a few things I am glad we have updated. 1. The rotary phone with a cord. 3. Good bye records, hello iPod! 4. Cars with cold seats (heated seats rock). 5. TV with three working channels (ok, I am fine with three channels, but I love the remote). 8. Camera film to develop. 9. Banker's hours (thank you ATM). 10. VCR cameras as big as an infant. Today I woke my daughter up early so we could go into the city to look for a prom dress. Though prom is nearly six weeks away, she assures me she is running out of time to get a dress. It wasn't long until we were in the car and our way. I was looking forward to the fun of dress shopping, but I'd be telling a lie if I said I was hoping to go to a lot of different stores. I was hoping for early success. As we enter the first shop, dresses fill the racks inside. There are prom dresses, dinner dresses, party dresses, bridesmaid dresses, and dresses for the bride neatly organized from the front to the back of the store. There are amethyst dresses, teal dresses, coral dresses, plain dresses, beaded dresses, short dresses, long dresses, ball gowns and dresses of all shapes and sizes. Salespeople hustle about as the crowds of shoppers enter and begin to fill their arms with dresses. Cassie begins to search the racks for possibilities. I'm pleased to see her begin to settle upon several dresses that might work for her. We carry the potential dresses back to the dressing area where a large group is gathered around a soon-to-be bride who is trying on wedding gowns. The bride-to-be stands on the raised floor with mirrors and loved ones surrounding her. The crowd stands around pondering each selection. What I would guess was the bride's great grandmother, stands toward the back of the group with new tears forming each time her granddaughter comes out in a new dress. Each dress looks stunning, and I can't help but wonder how she'll ever choose. All around us young women were trying on prom dresses, bridesmaid dresses and wedding dresses. Each stepped into the dressing room in their jeans and sweaters, and soon emerged in dresses that seemed to bring out their inner-Cinderella. It was amazing to watch the transformation. There was an energy in the store that was a tad bit contagious. Cassie tried on several dresses as we discussed the pros and cons of each. In my opinion, each dress looked beautiful on her. I couldn't help but remember the days, now long gone, when she'd run around the house in Disney princess dresses wearing crowns and playful gems. Thankfully, the woman helping us listened carefully to Cassie and came back with a few dresses she thought might work. Before I knew it, Cassie had decided upon a dress for prom. By the time we left, we had the dress, shoes, and accessories --- all in one stop and reasonably priced. Nice! Thank you fairy godmother. As we cross the halfway point of the challenge I find myself considering how my purpose in this challenge has evolved. Last year I joined the Slice of Life Challenge to get into the habit of writing. Surely after 31 days of making myself produce writing I'd have a writing habit. I jumped into the event with some apprehension. Would I be able to write every day? Would I be able to produce pieces I was willing to throw out into the world with such a short period of time to work on them? Would I have anything to say? Yes, there were days when I felt the pull of panic begin to run through my body as I struggled to find something to write about, but I learned a few tricks for getting something down. In a pinch I could write a list, collect some ideas, or dig back into time to find a story. There were some days where it was hard to push the publish button, but I kept going. I began to collect mentor texts of posts that seemed to provide inspiration in times of need. As the challenge continued I found myself in awe of the writing taking place on the blogs of participants. I found myself wanting to get home at the end of the day so I could read all of the stories. There were stories about school, poems about the beauty of the world, snippets of childhood memories, and reflections on life. As I moved from blog to blog I enjoyed the snapshots of small parts of everyone's lives. There were blogs that kept to certain types of writing, blogs that tried a variety of ways to put words on the page, and there were blogs that followed a story with a new piece each day. I was hooked. Each day I added new blogs to my sidebar. Before I knew it, I wasn't worried about the writing I was worried about the reading. How could I get to all of the blogs and leave the thoughtful comments these writers deserved? When it came time for the challenge this year, there was a moment or two where I wondered if once again I could allow myself to put out writing so raw and unfinished. Though that was a concern, I knew it wouldn't keep me from participating. My biggest worry this time was being able to keep up with the reading of the challenge. Friends reminded me that as participants we would read what we can and not feel guilty about it. I've made it my goal to read the three blogs under my post on Two Writing Teachers each day. Then I rove through blogs on my sidebar. My goal each day is to read three posts on blogs new to me and three posts on blogs I have visited before. My books stare at me each evening as I grab my computer. My Kindle wonders where I have been for the last few weeks. Right now, I'm focused on listening to the conversation this challenge creates. Thanks, Stacey and Ruth. Also joining the Poetry Friday round-up at Check It Out. Stop by to read the beautiful biographical poem about Martin Luther King and much more. Today is my sister-in-law, Lisa's birthday. She's the quilter in the family so I wrote this for her. Stop by her blog, Shreds of My Mind, to see some of her work. Happy birthday, Lisa. It seems games have changed since I was a child. When I was a kid there was always a loser. You didn't want to be the one tagged. You didn't want to be the last one with a card. You didn't want to be the one who had the least amount of points in a game. Apparently things have changed. Sunday my five year old niece came to spend some time with me. We went for a walk, played a few games, and had a few laughs. When she taught me how to play Mr. Wolf, I learned that you ask Mr. Wolf what time is dinner. He tells you and you take that many steps toward him. Then, at some point, he yells, "Dinner time." Players then have to run and try to not get tagged. E and I were playing and chasing and having fun when I joked, "I hope I don't get tagged." E paused, turned to look at me, and said, "Aunt Cathy, it's fun to get tagged." "Hmmm," I thought to myself, "that's a new twist." That little sweet girl has more energy than I do. Finally I convinced her we should go inside to play games for a bit. "Let's play Old Maid," she suggests. Years of playing Old Maid with my grandparents makes this a game I always love. I have all kinds of tricks for passing the old lady to an unsuspecting player. I know a hundred faces to fool my opponent. I grab the cards and begin to deal. "Aunt Cathy," E declares, "let's play so the person who gets the Old Maid is the winner." It seems games have changed a little bit since I was a kid, at least when E is around. It doesn't matter if you get tagged. It doesn't matter if you are the last one with a card or hold the Old Maid. It doesn't matter if you have the least amount of points. The fun is in playing the game whether you win or lose. Maybe E is onto something. Today is my dad's 70th birthday. 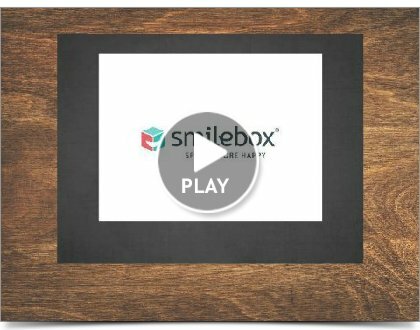 To celebrate I created a little Smilebox for him. Happy birthday, Dad! Today was one of those crazy days at school. You know the kind; the ones where you laugh to yourself about being held accountable for learning when so many other things go on in a day. Today we had a fire drill, a lockdown drill, and a musical assembly. Now that does seem like a lot of interruption, but on the bright side it is all in one day.....and, of course, the musical was terrific. Our fifth graders are so talented. For me, days with our schedule out of whack are hard. Our routine has a lot to do with the climate in our classroom, the work that will get accomplished, and the general management. Thankfully, this year my group of students is very flexible. They handle change of routine very well, and despite the interruptions we got quite a bit of learning accomplished. Yes, my class rocks! 8. Lunch in the lounge. 5. Talking with my mom. 4. Finding time to write. 3. Someone else did the dinner dishes. It's funny how sometimes someone will say something and you'll suddenly remember something you had nearly forgotten. This was the case the other day when my sister-in-law started to talk about bananas and chocolate. As soon as she mentioned it I was reminded of the frozen bananas we used to get at the Dairy Queen. You see, one of my mom's favorite treats was ice-cream. I'm not sure if she loved it as much as she loved the memory of her grandfather taking her out for ice-cream, but either way I won. Every once in awhile my mom would look at me and say, "Let's go get some ice-cream." I, for one, didn't have to think twice. We'd jump in our car, drive out of our small town, and into the next one. The next town had a Dairy Queen full of many sweet delights. Here you could get frozen bananas, dilly bars, milkshakes and many other cold treats. Our favorite treat was a banana split. My mom was good at ordering them. We'd have three scoops of vanilla ice-cream. One mountain of ice-cream would be topped with chocolate syrup; the other with strawberry. She'd manage to get rid of the pineapple topping to have it replaced with chocolate ice-cream with marshmallow topping. I'm sure all that sugar was offset by the bananas tucked carefully down each side. We'd sit at the benches inside the Dairy Queen and watch the cars go by. Enjoying our sweet treat and the time together. There's something about ice-cream that just makes life melt away. Enjoy the sounds of birds. This resource of the Ohio Department of Natural Resources is one of my favorite sites for identifying the sounds of Ohio birds. What's luck? I've never considered myself lucky. Yes, I'm blessed with a life for which I'm truly thankful. Yes, there are many ways I've been fortunate to have good things happen, but I wouldn't consider any of that luck. My grandma was lucky. When I was a kid I used to go to Bingo with her on Monday nights. I couldn't play, but I was allowed to hang out with her. Grandma would buy me a pop - not just any pop - a coca-cola in a small glass bottle. I'd keep her company while she stamped away on her Bingo card. She seemed to always win. I heard her yell Bingo on many a night. My brother seems to have her luck gene. He stumbles into the craziest lucky situations. If he were to walk into a casino, he'd likely walk out a winner. I've tried a few lottery cards, but usually don't win --- unless my brother buys the cards for me. If he has bought the card my odds of winning improve exponentially. I'm not lucky. I've participated in many office lottery polls, and our numbers have never won anything. I put my names in for drawings and it is never picked. When we went to Las Vegas for NCTE, I didn't touch a single slot machine. Why should I put money into something I'm never going to win? I just can't bring myself to do it. I learned long ago that I'm just not lucky. I'm ok with it. Today I spent the day at #edcampcbus. It was an amazing day of learning. At the end of the event they had a smackdown and during this time prizes were to be given. I always stay to the end of events for the "prize" time, but I never ever win. I'm used to it. I enjoy seeing everyone's excitement when they win something. So names started to get pulled from the box. Shirts were given away. Gift cards were given away. Then Simple K12 was giving a year's subscription to their site. Imagine my surprise today when I heard my name called. I'm feeling kind of lucky tonight. Maybe I should scratch those lottery cards my brother got me for my birthday. Poetry Friday is hosted by Heidi at My Juicy Little Universe. Stop by to follow links to more poetry. the bird chorus at sunrise. the rain bouncing off pavement. all that is before us. A few weeks ago I attended the Dublin Literacy Conference and listened to Louise Borden. I was fascinated by her life as a writer. The stories she told of collecting artifacts, researching topics, and planning stories really captured my attention. I was awed by the writing process she shared, but also a little envious of the time she is able to chase an idea. Listening to Louise, in combination with talking with participants of this challenge, inspired today's poem. When we sat down at the table at my grandparent's house, my grandpa always said, "If there is something you do not like, take a spoonful to try. You might find out you like it, or over time you might learn to like it." As a kid I wasn't sold on this advice, but as an adult I've seen some of its advantages. It's a good idea in theory, but there are a lot of foods I didn't need to learn to like to eat. I didn't need to learn to like sour cream. I didn't need to learn to like bleu cheese. I didn't need to learn to like coffee. So when my sister-in-law, Lisa, came into our house one day with biscotti, I was a little skeptical. I'd seen biscotti on the counters of Starbucks. I'd seen biscotti in large glass containers at bakeries. I'd seen it in a lot of places, but I really had no desire to try it. It looked dry. It looked crunchy. It really didn't look like something I would like. After all, there are muffins, doughnuts, cookies, and other bakery delights to enjoy. I loved it! Yes, it was crunchy, but it was sweet and delicious. Lisa left the biscotti with me, and I enjoyed every last piece. I learned how good biscotti was with coffee. For some time Lisa would bring biscotti with her every time she came. It was always a treat! I was pretty sure life couldn't get any better than this. My sister-in-law does live almost two hours away. She couldn't bring biscotti with her every time. Eventually Lisa decided it might be best to bring the ingredients and recipe. I couldn't imagine making biscotti as good as Lisa's so it was quite some time before I finally gave it a try. One evening - in complete biscotti desperation - I grabbed Lisa's recipe and began to bake my first batch. It was better than I had anticipated, and thanks to my Kitchen Aid not nearly as difficult as I thought it would be. I just threw the ingredients into the Kitchen Aid, mixed, baked, cut and baked again. Ba-bing, ba-bam, ba-boom. I learned to like coffee because everywhere I went coffee was the offered drink. Yes, I sugar it up. Yes, I cream it up, but I taught myself to like coffee. I'm not going to lie, at this point in my life I like that little kick in my morning. I didn't have to teach myself to like biscotti; it was love at first bite. It is a bonus that it makes coffee taste even better. Now I make biscotti all the time. Now I have a biscotti addiction. There are certain things in life you shouldn't learn to like or find out that you like. I'm pretty sure the sweet treat of biscotti may be one of those things I should have tried to resist. Perhaps it would be better if we'd stick to the same basic food and not treat our tastebuds to the delicacies of life like biscotti. My sister-in-law's recipe is a cranberry almond biscotti that is de-lish. I've made it several times now. Julie Johnson, at Raising Readers and Writers, also loves to make biscotti. She is always talking about this flavor and that flavor so I've decided I need to try a few other recipes. Yesterday on our snow day I decided to try a new recipe and made cranberry white chocolate biscotti. What kind will be next? Suggestions? For days there is a rumor of her arrival. "Snow is coming," say the people. "Will she be here?" the royals wonder. There was a rumbling she could change her mind. Still everyone prepares for her impending visit as they rush about to get all that is needed. Finally the day of the Royal Ball arrives: the food is prepared, the glasses shine, the tables are arranged, and the carpeted dance floor is ready. Raising their instruments the band begins to play and guests promenade into the ballroom. Rain makes an early entrance to the party. Ice is noticed talking with Temperature. Wind blew in quickly and got the attention of the crowd. Still, where was Snow? Was she coming? The crowd whispered among themselves wondering if she would make an appearance. Snow had a reputation for being unpredictable. She did what she wanted. That's part of the reason others were so fascinated by her. Sometimes she'd say she was coming and then not show up at all. Other times, she would sneak in unexpectedly shaking up planned events. Hours passed and Snow still had not arrived. People began to doubt she would attend the event. "That Snow, she is so flighty," they gossiped. The music continued to play as Wind, Rain, and Temperature dominated the dance floor. Suddenly a hush fell upon the crowd. Everyone turned to look. For a moment, Wind could not move. Rain, in her gray floor-length dress, turned to look and then dashed out of the room. There, at the top of the dark staircase, stood Snow. She was stunning. Her white gown glistened; blanketing the room in her beauty. Each stitch on her dress had been exquisitely sewn with unique style. Her gown seemed to say "come closer" and "stay away" all at the same time. Ice stood back, wondering if Snow would speak to him this time. Temperature immediately rushed to take her hand as Wind moved closer captivated by her allure. Snow slowly stepped into the room; shy at first, but soon drifting down the flowing staircase with growing confidence. The crowd seemed frozen by her elegance. Trees bowed as she walked by them; bending their branches in awe of her power. Moon smiled as Snow's gown reflected the glow of his shiny cheeks. Though Snow was unpredictable, Moon couldn't help but feel a sense of pride every time he saw her. A soft murmur soon turned into a thunder of conversation as guests chatted about Snow's arrival. The ballroom, moments ago silent, again became filled with laughter, music and dancing. The royals knew Snow's arrival would make this an event sure to be on the front page of every newspaper. The reporters quickly arrived to interview Snow and take pictures, hoping to capture her stunning beauty. Photographers searched for the picture that would capture the smoothness of her skin, the glimmer in her eye, and the contagious sparkle of her smile. Snow danced for a bit with Temperature; their steps on the dance floor watched carefully by all. Temperature had a way of making her feel flushed. It wasn't long until Wind cut in for his dance. Wind swept Snow around the dance floor until she felt dizzy. Snow soon realized she must go. The hot crowded room was making her uncomfortable. She wanted to get back out into the cool air. She wanted time to walk and to think. With a quiet nod to Moon, Snow stepped back out into the dark night. As mysteriously as she had arrived, she disappeared. Temperature and Wind were unsure what had happened. The royals were disappointed she had to leave so soon. The newspapers and reporters all talked about her for weeks following. She had not been seen since the event. Once again everyone searched for Snow. Snow read the papers and smiled to herself. She liked keeping them guessing. Who knew where she'd turn up next?